Spring is in the air, and it’s not just wardrobes that Oahu’s residents are wanting to update for the new season. Trends in kitchen remodels are constantly changing, and Homeowners Design Center is here to help islanders keep current with today’s modern styles as they evolve. 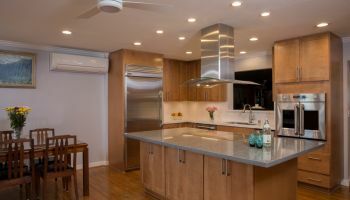 When the Kawachis met with the company about planning their kitchen remodel, Homeowners Design Center didn’t hesitate to supply the owners with a wealth of ideas and information in order for them to find just the right fit for their remodeling needs. 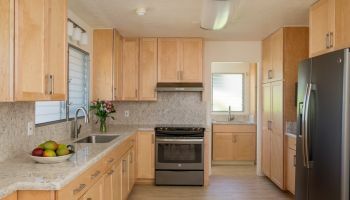 Jessica Omoto, Project Manager for Homeowners Design Center, explains the undertaking of this kitchen remodel makeover. "The owners were looking to do an update of their outdated kitchen," says Omoto. Though the company didn’t change much of the structural aspects of the room, the look and feel of the space evolved exponentially in terms of style and modernity. "We went in with a mixture of dark cherry wood cabinets with an espresso finish and upper cabinet aluminum doors, with some frosted glass inserts" explains Omoto. "And then we added some white (quartz, low-maintenance) countertops which gave that nice pop and contrast to the look." Using contrasting colors between the dark cherry wood cabinets and the white quartz countertop helped to create the modern look. Omoto describes the kitchen remodel as modern and minimalist, showcasing, “...very clean, very simple lines.” Acting as the perfect pairing to the cabinets and countertops are beautiful aqua accents seen both in tasteful, teardrop, lighting fixtures and ocean-hued tile. “We wanted to bring in some color which was relaxing to the kitchen atmosphere,” says Omoto. “This gives the room that nice pop of color, while still keeping it simple.” The light fixtures especially, remarks Omoto, “...tie everything together and give the room that nice, finished look.” The nuanced layers of colors and textures really made for the modern look in the kitchen remodel. The aqua accents in the frosted lighting fixtures and glass tiles completed the modern makeover. For more information about Homeowners Design Center and how they can help you with your kitchen remodel, or to see even more of their projects, click on anywhere you see their name.